You know you’re Up North when a bear stands by a cross-walk on the main street in town and everyone thinks it’s just dandy. There is such a bear in Elk Rapids. Parents plop their children on its back and take pictures. Kids lean against it. The Village grooms its coat. As bears go, it is a very docile bruin. Do not be alarmed. Those people are not constructing a cage for The Bear. They are constructing a jail for miscreants who show up for Harbor Days without their Harbor Days Button. The Bear has a name—Whistle Up the Bay-rr—but everyone just calls it The Bear, much as everyone calls Chicago’s Cloud Gate The Bean. 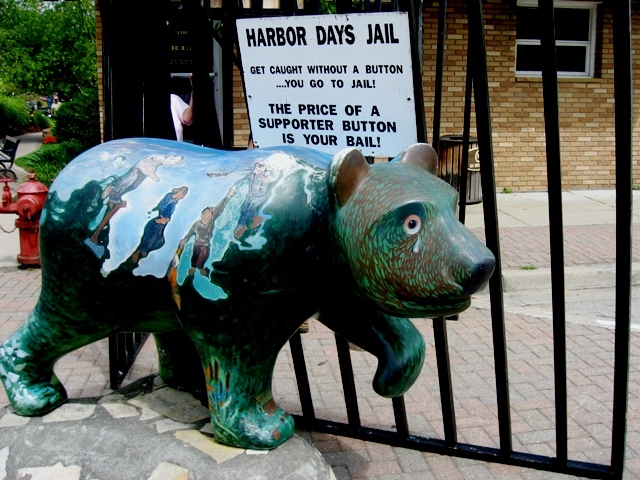 The Bear was installed on River Street in 2005 and grows more beloved each year, like a teddy bear that has been dragged up and down the stairs and out to the sandbox more times than you can count. 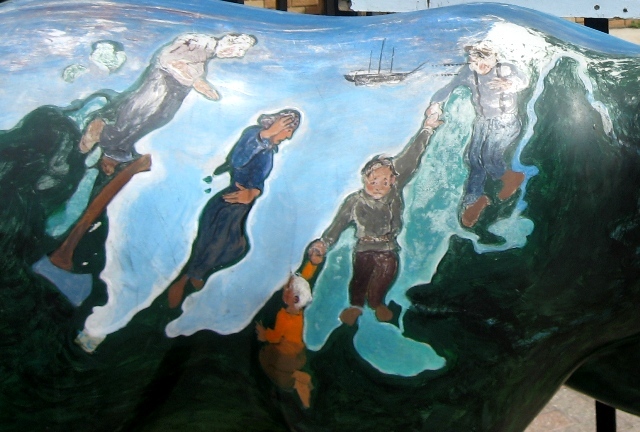 It was painted by Eastport artist Betty Beeby, who covered it with scenes and characters from Whistle Up the Bay. Written by Nancy Stone and illustrated by Betty, the book was based on the true story of the three Guyer boys, one of whom grew up to be Grace Guyer Hooper’s father. Grace was a storycatcher, an eccentric, and a role model for the hordes of local historians who follow her footsteps along the sandy two-tracks of Antrim County. From any angle, The Bear is splendid in its blue and green coat. Lake Michigan splashes across its back, the Bay and the Chain-o-Lakes flow down its side. A schooner from the lumbering era moves away from the dock up in Old Antrim City. But, but . . . I know. Why was Betty Beeby painting fanciful scenes on a bear??? I will tell you. For awhile there was quite a vogue for public art projects involving large fiberglass animal forms decorated in creative ways. It started in Switzerland, but by 1999 there were Cows on Parade in Chicago. People loved the cows. The American Red Cross of Northern Lower Michigan, recognizing a cheerful trend when it saw one, organized fund raisers Around Here based on other fiberglass critters: The Great Northern Fish-In of 2003, and The Great Northern Hunt for Bearable Art of 2005. So that’s the whole story of The Bear on River Street. Pretty much. To be continued. As soon as I get out on bail. What a beautiful bear, I’m normally not a fan of bears, the stuff of childhood nightmares, apart from Winnie The Poo (before Disney got their paws on him that is). We have sheep (Flocking to Skipton) not bears. Ohh, I remember those! 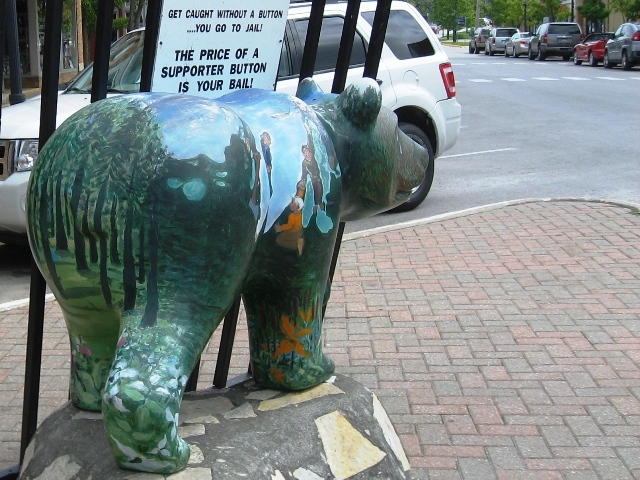 I think The Bear is popular because, like the sheep in Skipton, it’s related to its environment. Whimsy is all very well and good, but it should be relevant whimsy. That is one colorful bear! The peninsulas and chain-o-lakes in particular are very imaginative. Very! Betty is a very imaginative person. Very! Your bear is wonderful! Does it get clear-coated every year, or something, to help protect against the effects of sitting children, weather and such? It must – it looks very good for having been around a few years. I especially like the association with the book and local history. Our pelicans are painted, too, but with local flora and fauna more than history. Thank you. I don’t really know how he’s cared for, but he has held up well. He’s had his paws full with the weather this year. Gerry, you didn’t wear your pin ? In Toronto that large animal phase was represented by Moose and along the Halifax waterfront, Dolphins. I think that bear is lovely and I enjoyed the story. Are there more bears to show us ? I confess. It was a put-up job. I took pictures, went over and helped put the jail together, got into it and had my picture taken – and was clutching my pin in my hand. The moose and the dolphins sound like suitable iterations of the theme. There were more bears in the original exhibit (there are links on the Great Northern Bear Hunt site) but I don’t know how many of them are still in place. The next bear I show you will probably be from the Elk Rapids Historical Museum “Treasures from the Toy Chest” exhibit. thank you so much for the complete story on the bear! I loved it all and will go and closely observe the bear to find all you have written of. He certainly is fun to see when the weather is not great – makes me appreciate the indoors with a good book, glass of wine and a working fireplace! You are entirely welcome. The Bear will no doubt appreciate the attention. 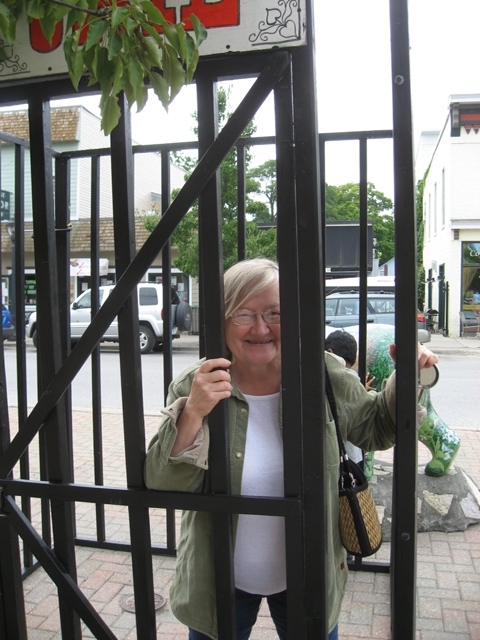 You’ll have to let an ignorant foreigner in on the secret…what are Harbor Days? I am sorry – I forgot to explain, or at least provide a link. “Harbor Days” is the name given to the annual Elk Rapids summer festival held the first weekend in August. It involves a parade, an enormous Chicken Dinner barbecue by the Rotary Club, fireworks, bake sales, carnival rides, sidewalk sales, bingo, sandcastle building–in short, pretty much any Up North Michigan Resort Town Activity that anyone wants to sponsor. I’m away from home but lessee . . . OK, here is a link to the Harbor Days website and a separate one to the 2012 button design. P.S. Here, for good measure, is a look behind the scenes at the 2011 Harbor Days. I am a great supporter of such events but do not actually go to them much. They are an excellent place to bring grandchildren but entirely inappropriate for even well-behaved dogs, which as we all know I do not have in any case. I like the idea of barbecuing an enormous chicken. Thanks for the information. I will follow your links. Oh my – I like it too. I think I will suggest an Enormous Chicken logo for next year’s Rotary T-shirts. The Cowboy is looking thoughtful. Love the bear! 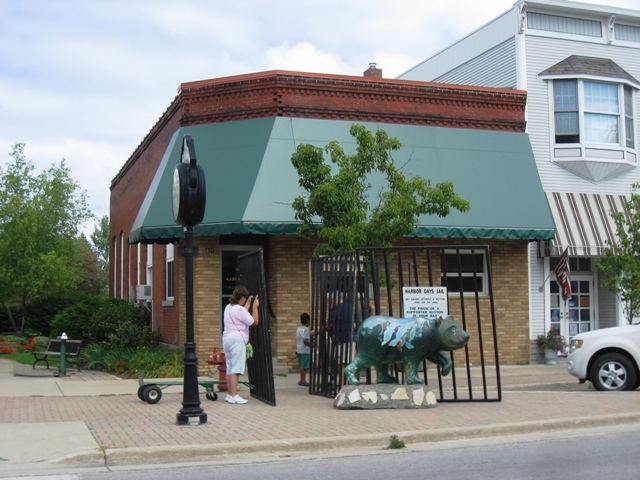 My grandfather had a petting zoo next to his service station back in the 1920’s, in Muskegon. A customer brought him an abandoned baby black bear. My grandfather named him “Snappy,” & he became a beloved family pet. Other kids had dogs & cats….my mom and her siblings had a bear! I have a photo of my grandfather, his brother, who was his business partner, & Snappy standing in front of the gas pumps. Snappy is standing upright & he’s drinking a bottle of Coke…which he loved!